Details: 2001, Poultry meat and skin. Gelatin Silver Print. 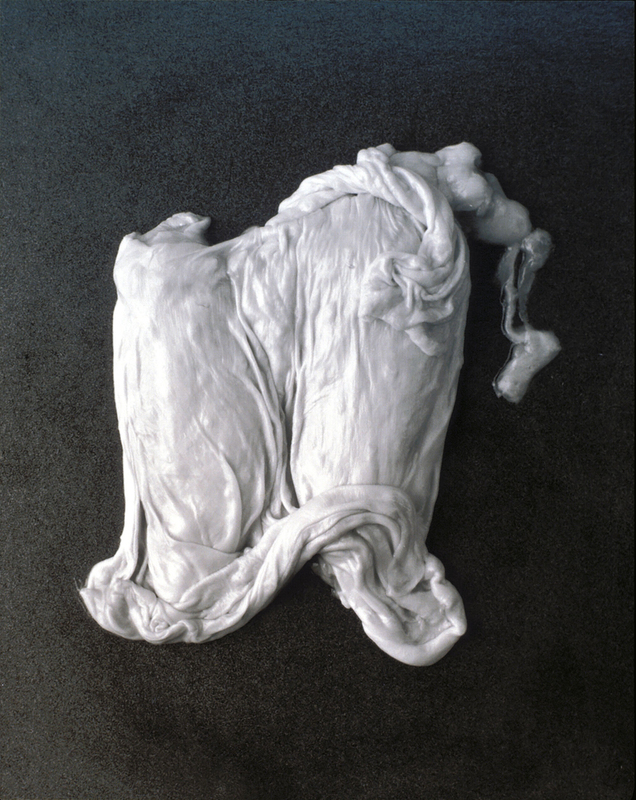 20" x 24"
Corpus Inductum (2001) recreates the loincloths of Christ, fashioned from surgically dissected poultry skin and meat. Meticulously reconstructed from the paintings of Fra Angelico, Rubens and others, the elaborate configurations of skin are photographed in the manner of 19th century medical photography. The free-floating objects recall both pathological specimens, and the fleshed-out, bodiless figures of a J. Peterman catalog. The elaborate drapery, knots and flourishes of the loincloths appear to be a locus of religious ecstasy and pain, conveying the essence of Christ’s status as both frail human and God. Like a cross between Dr. Frankenstein making a monster and Julia Child creating a farce, I seize the spirit of what Gayatri Spivak calls the “scrupulously fake,” by literally creating the Lamb of God out of food. Corpus Inductum conflates his corporeality with its covering, creating a body that is both resplendent and dejected, real flesh, yet inscribed by a history of human gestures. The synecdoche of the loincloth for Christ’s body not only insists that it is a cultural object/figure, but it functions fetishistically, flagging our anxieties of loss or human desire. The loincloths appear like disembodied organs (a heart, lungs, and testicles), or like textual scrolls, underscoring the dense metaphors of eating, knowledge, and sacrifice. Corpus Inductum posits an elegiac masculinity that is darkly exuberant, joyously tendentious, and hauntingly incomplete.